Rain makes the grass green and it makes your garden grow. Have you ever wondered what makes rain though? There are always tiny drops of water vapor in the air. Warm air has more water vapor than cold air, which is why it is often humid in the summer. Warm air rises, and with it rise the water droplets. These tiny drops rise if cold air blows in. Mountains can also make them rise, which is why it rains a lot there. When the air holds lots of water droplets, clouds form. If a lot of water droplets gather in the clouds, the clouds become heavy. Gravity causes the water droplets to fall as rain. This is how rain is formed. 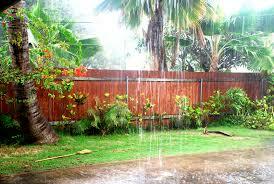 Read on to know more all about rain. Rain happens in two ways usually: as a drizzle or a shower. A drizzle is a slow, light rain that can go on for hours. A shower is a fast, heavy rain that lasts just a short while. Raindrops fall at a speed of 7 to 18 mph. In wind, they might fall much faster. Flash floods happen when it rains a lot and water rises very quickly. Flash floods are dangerous. They kill more people in the U.S. than tornadoes, earthquakes or lightning. Weather reporters use Doppler radar to detect rain, hail and other storms. This equipment can tell how much moisture is probably coming, as well as the wind speed. Rain contains more than just water. It might contain dirt, dust, insects, grass or even chemicals. Hawaii gets over 63 inches of rain every year, making it the rainiest state. A video animation of how and why rain happens. Question: How much does it rain every year? Answer: How much rain you get depends on where you live. Hawaii gets over 63 inches of rain every year, making it the rainiest state. Nevada gets only 9 ½ inches of rain each year, making it the driest state. Western states are usually pretty dry. Places in the south, the Pacific Northwest and the east coast get more rain. Enjoyed the Easy Science for Kids Website all about Rain info? Take the FREE & fun Rain quiz and download FREE Rain worksheet for kids. For lengthy info click here. Declan, Tobin. " Fun Rain Facts for Kids ." Easy Science for Kids, Apr 2019. Web. 21 Apr 2019. < https://easyscienceforkids.com/all-about-rain/ >.